On Monday, March 15, Rosemary Nelson, a leading human rights lawyer in Northern Ireland, was killed by a car bomb. But even real Loyalists-that is, violent pro-imperialist groups-have been known to be manipulated by the Northern Ireland police, the Royal Ulster Constabulary, and the British intelligence services. Sometimes groups are even invented as a cover for illegal actions. Gerry Foley interviewed Bernadette Devlin McAliskey for Socialist Action about her view of the killing and what needed to be done about it . 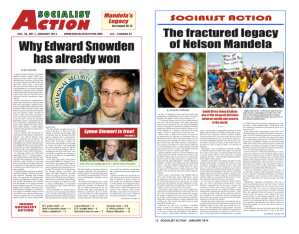 Socialist Action: In your opinion, who killed Rosemary Nelson and why? Bernadette Devlin McAliskey: The first suspects are the police. Rosemary, as a human rights lawyer, had been involved directly in a number of cases. The sympathy notices in the local newspapers clearly indicated the wide range of causes and cases she had taken up. There were statements from travelers’ rights groups [travelers are an itinerant caste that originated with farmers driven from their land after the great famine], and just about everybody who had their rights trampled on. But very specifically, Rosemary had been involved in a number of high-profile cases going back some considerable time. There was the Colm Duffy case, during which in fact she had been threatened by the police. Her case is similar to that of Pat Finucane [a human rights lawyer murdered in 1989]. People who would be arrested and taken to interrogation centers when she would be their lawyer would actually get messages from the police to her. The police would make threats in the interrogation centers to people about her. Rosemary followed those all up very systematically. She had been instrumental in the broad issue of the threats against human rights lawyers here. There had been a UN-led inquiry, which had said essentially these things are serious enough to be looked into. They had encouraged Rosemary to go through all the channels and exhaust them in her own right as well as in the right of her clients. Just to focus it: Rosemary had been central (1) to a United Nations investigation into, at a minimum level, police failure to protect human-rights activists, particularly human-rights lawyers, and at the highest level, threats by the police against human rights lawyers. (2) She had been representing the Hamill family. This was a case where a young Catholic male, Robert Hamill, had been kicked to death, literally kicked to death by a mob of Loyalists, who had beaten him to the ground, kicked him, and stomped on his head until they killed him. He had been in the company of his sister and friends. Members of the RUC had watched it happen, and despite the pleas of his sister to come to their aid, the police just stood by and watched it happen. Rosemary Nelson was representing the family in that case. She had taken both criminal and private prosecution against the individual members of the RUC who were on the scene. So, she was involved at that level. (3) On the heels of the United Nations investigation, she had also made specific allegations to the Police Commission. These had been investigated by the RUC, reported back to the Police Commission, which is in fact a government-appointed body. It is a rubber stamp. It has no backbone. But it was so bad that the Police Commission felt obliged to call in the Metropolitan Police to redo the investigation. And the findings of that investigation were due this week. Therefore, at four levels, Rosemary Nelson was consistently exposing the corruption of the RUC and consistently setting out a case, not that the RUC colluded with Loyalists, but that the RUC were the main actors. They got assistance from Loyalists but they were the main operators. Then look at who had the means. Rosemary had been in Donegal [across the border]. She only drove into her own driveway at 7:00 on Sunday night. At some time during that night, somebody attached a sophisticated car bomb to the bottom of her car. Now when you ask again, who could have had access given the area in which she lived, there was a police roadblock, there was a security presence, which is now not so frequent. She lived in what was quite an up-market area. The police were in the vicinity of her house on the night that somebody placed the bomb there. So, you would have to say that the RUC would have to come up with some very convincing proof that it wasn’t them. SA: So, is it generally believed in the area that the police did it? BDM: Not just in the area, there is a general concern at higher political levels. Even the Social Democratic and Labour Party [the bourgeois Catholic party] have called for a totally independent inquiry. The [Northern Ireland] chief constable, Ronnie Flanagan, was under sufficient pressure that he had to announce very quickly that an RUC investigation would be headed by a non-RUC police official, somebody from the English police. Some guy’s coming over to lead the RUC investigation, as is somebody from the FBI. It is very important that people understand that this is not really an independent investigation. It’s what we would call, “Ask my brother, am I a liar?” Any American with their heads screwed on properly would know that the last person we want to send in to investigate a corrupt police force is the FBI. I’m quite sure that Mumia, and Leonard Peltier, and thousands of other people could testify that the FBI are just more efficient and more sophisticated at the kind of work that the RUC cover up. SA: But there is a general demand for an independent inquiry. BDM: All of that is in the public eye at the moment, with regard to the Finucane case and now the Nelson case. The issue was increased by Rosemary Nelson taking up the Hamill case and openly calling it an example of racism, openly linking it to the Steve Lawrence case in London [a Black victimized by the English police] and directly identifying it with the Diallo case in New York. She was making all these connections. She had a front-page article in the Irish News on the Monday that she got killed. She had two main features on the front page of the Irish News on Monday explaining that we were dealing with racism here and were confronted with institutionalized racism of the police that wasn’t any different from the institutionalized racism of the English police against Black people. That’s in the newspaper on Monday morning and she’s dead on Monday afternoon. So, all of this is building up in the public eye, and they take her out. I think that there is a high level concern on the part of people who would rather not look at it that the police have simply taken Rosemary out of the equation, and in the knowledge that they can get away with it. SA: That’s the next question, can they get away with it? BDM: Well, I think in their heads initially, yes, they thought they could. The choice of Rosemary as a target was strategic, was in their own interests. And the timing was strategic. Sinn Fein have come to the last hurdle in their peace process. But the sheer audacity of these people is really what takes me. These people, knowing that they were the subject of scrutiny, albeit by a small group of UN officials; these people, knowing that they were the subject of attention around the whole issue of threats and assassinations, simply went and organized, orchestrated, and executed the person key to shining that light on them. It remains to be seen whether they’ll get away with it or not. SA: What can be done to make sure that they don’t get away with it? BDM: Well, the first thing is to make sure Rosemary’s work is continued. I don’t see lawyers queuing up to do that here in Northern Ireland. We may have to appeal to lawyers, or a consortium of lawyers, from outside to make sure that it is done. Also, I think we need to think about building an authoritative international tribunal to investigate Rosemary’s murder. April 3, 1999 in Civil Liberties, Europe.